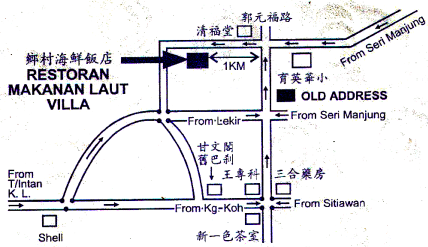 Are you within the vicinity of Kampung Cina, Sitiawan? 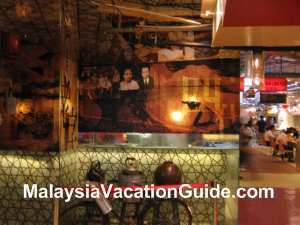 If you are and are looking for no-frills, reasonably priced Chinese seafood, try going to Restoran Makanan Laut Villa in Kampung Cina. The owner has just shifted to a new and bigger place 2 km away from the old place. The spacious restaurant in the middle of the plantation. 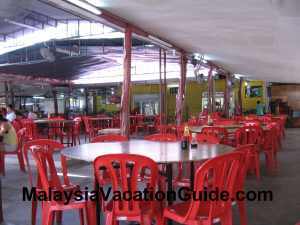 This non-air-conditioned restaurant with coconut trees behind serves authentic Hock Chew food and is packed especially during school or public holidays. It is located further away from the town centre in a plantation but is easily accessible if you have your own transport. 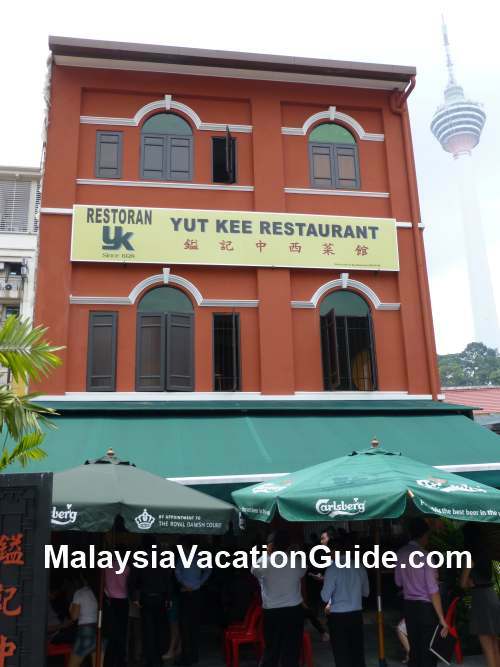 The typical food that you can try are red wine mee suah. 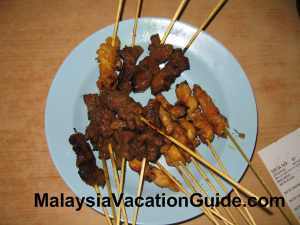 This is one of the most popular dish that the Hock Chew people take all the time. The soup is cooked using sesame oil, ginger, rice wine and chicken before the mee suah noodle is added in. A nice aroma is produced while this dish is being cooked. 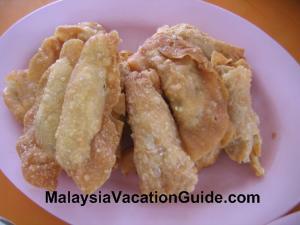 Sweet and sour fish maw dish is cooked using ingredients such as bamboo shoots, chilly, carrot and celery. 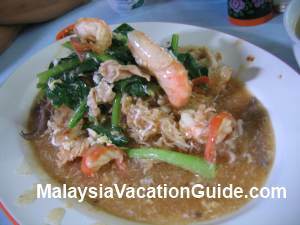 Other dishes you can try are the sweet sour crabs, "loh mee", deep fried prawns, steam or sweet sour fish and fried noodles. 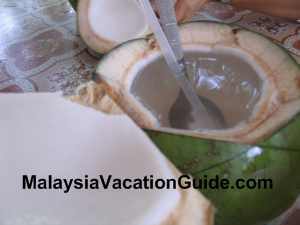 Coconut juice and flesh are a favorite with most children. 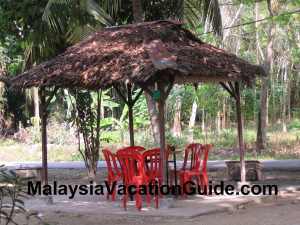 Dining under the coconut trees. 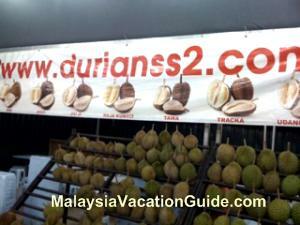 Fresh coconut juice and its flesh is available as well. 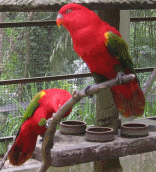 It is believed to have "cooling effect" for the body. Not many restaurants want to serve the fresh coconuts as they are messy and troublesome to serve. The juice and the flesh can be taken using a straw and a spoon. The famous Hock Chew mee suah cooked with red rice wine. Fried noodle for 1 person. 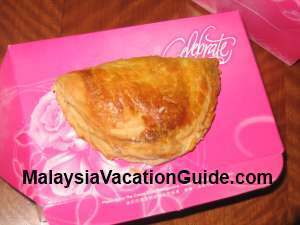 The restaurant is about 10 to 15 minutes away from Sitiawan town. 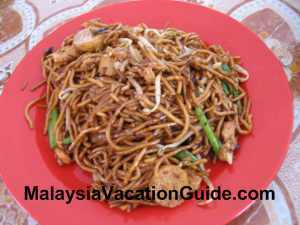 Get Sitiawan mee suah directly from the producer while you are here. See how the noodles are made while you are here.